Instead of building a typical public hospital, the Alexandra Health System naturalised an adjacent stormwater collection pond and commissioned a barrier-free, biophilic building to create a waterfront, inclusive, healing space popular with patients and nearby residents alike. Photo credit: Khoo Teck Puat Hospital. In 2005, Alexandra Health System (AHS) was tasked to plan the new Khoo Teck Puat Hospital (KTPH) in Singapore’s Yishun suburb. "The government let us choose from nine different sites [but] it was a no-brainer," shared Mr Liak Teng Lit, AHS Group Chief Executive Officer, at a talk in 2012. The chosen site’s main draw was the adjacent pond and park. It had the potential to a welcoming and restful place conducive to healing. "We were very conscious that our building would not stand out like a sore thumb," said Mr Liak, of their vision of a building that would "humbly" fit in. The management also assured the then Member of Parliament for Yishun that the hospital would not take anything away from the residents. The AHS team knew a large construction project would have an environmental impact on local biodiversity: land clearance could cause local animals to scatter, while construction runoff could pollute the surrounding waters and affect soil quality. The pond was also "not a pretty sight", added Mr Liak. It was, in fact, a bare stormwater collection pond, surrounded by granite and little foliage, "that nobody used". Hence the management had the challenge of ensuring that the hospital would not just serve patients, but would also enrich the neighbourhood with its architecture and landscaping, at the same time enriching biodiversity of the area. When KTPH embarked on the biodiversity replacement initiative, Mr Liak set a goal of the area eventually hosting 100 species each of birds, butterflies, fish, and plants. It was an especially tall order, as he wanted species native to Singapore and Southeast Asia to boot. Planting the flora was easier than introducing fauna. To attract butterflies – picky creatures that require very specific conditions to breed – the hospital had to create gardens that enjoyed full sunlight yet were sheltered from strong wind, and have a variety of plants to attract different butterfly species. To boost survival rates, staff even brought caterpillars home to hand-feed them thrice a day until they metamorphosed. KTPH decided not to use broad-spectrum insecticides, which kill caterpillars. Signs were put up while staff were trained to explain to the public that critters like caterpillars, millipedes, worms and even bees are harmless and welcomed on the hospital grounds. Four distinct freshwater environments were created within the grounds to rear fishes and attract insects like dragonflies. With so many water bodies within the hospital, the management made sure that good water management facilities were incorporated into the building blueprint. This would manage the water cycle – from the collection of rain run-off to the disposal of excess or polluted water. There was also a need to train their maintenance crew to deal with mosquitos. From 2006 to 2011, as part of Singapore’s national water agency PUB’s ABC (Active, Beautiful, Clean) Waters programme, the PUB and KTPH, in collaboration with the Housing and Development Board and the National Parks Board (NParks), transformed the once barren pond and the park nearby into a lush, health-promoting and welcoming garden for patients and residents of Yishun. A barrier-free lakeside promenade was built to connect the hospital’s central courtyard to the garden, while a footpath for walking and jogging was upgraded. Inter-generational fitness corners were built, and benches and spaces were introduced around the garden to spur social interaction. Another placemaking initiative was launched when KTPH heard that a group of community farmers was about to be displaced from their community farm plots, and it offered them rooftop space to pursue their interest. Creating this rooftop farm required a strong commitment from KTPH’s management. Glenn Bontigao of Peridian Asia, the company in charge of KTPH’s landscaping, said: "A rooftop garden is a concept that usually gets axed when value engineering comes in. It is difficult to maintain not only because of the manpower it requires, but also because of the logistics issues related to its location. You have to bring in soil, material, tools and people." In this case, the architects made the rooftop accessible with stairs and lifts, so that materials could be easily transported to and from the farm. The efforts to create lush gardens and thriving ecosystems in and around the hospital have paid off. KTPH now has achieved the target of 100 species of fishes, while there are now 24 species of dragonflies. The butterfly species count has also risen dramatically from three to 60. Sixty-six native species of birds have since called the hospital their home – bringing their cheerful bird song to the hospital complex. At the Yishun Pond, nine wetland species, including the threatened Purple Heron and Black-crowned Night Heron, have been spotted. 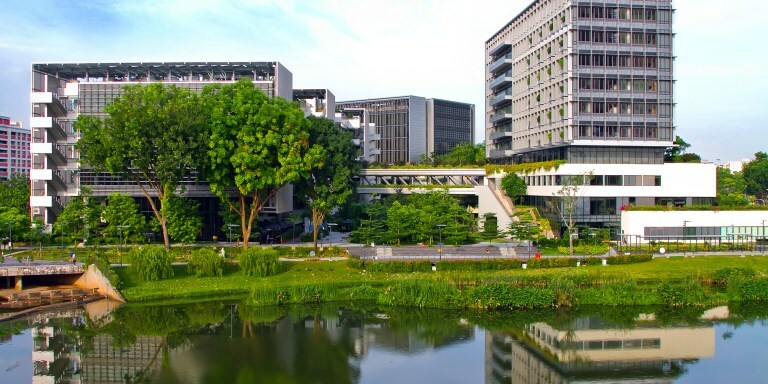 Dr Ho Hua Chew of the Nature Society of Singapore, who was involved in the introduction of nature to KTPH said: "Experiments have shown that patients recover faster in environments with greenery. I’m quite sure that, if nothing else, the depression caused by being hospitalised will be lifted if the patients can see flowers and butterflies and hear birds singing." The removal of physical barriers between the hospital and adjacent park and pond has led to people moving freely between the two areas. Patients and their families gather by the pools in the gardens while Yishun residents drop by to use the cafeteria and retirees practise tai chi on the level platform beside the Yishun Pond. The one-kilometre path around the pond is a popular jogging and brisk walking track because of its flower trails, pebble shores and mini wooded area. Dr Ho added: "I have never seen people feel so welcome in a hospital environment." The Centre for Liveable Cities (2016) Khoo Teck Puat Hospital: Healing with Nature. Urban Solutions, Issue 8: Building with Nature. Published Feb 2016. The Centre for Liveable Cities, Singapore.